The art of film making in malayalam has gone far beyond with the arrival of young movie aficionados, ready to forfeit their life to make their dreams come true. From a stagnant pattern of telling tales, the young film makers packed with thoughts beyond imagination dare to take those themes which could keep their foot burning. Filming movies in exotic locations may not be new in malayalam film industry. But it would add more nosiness while a plot is planned in 'Africa', a land which was once called as 'The dark continent'. Now a malayalam movie is under work which will tell an unusual tale completely shot in West Africa. 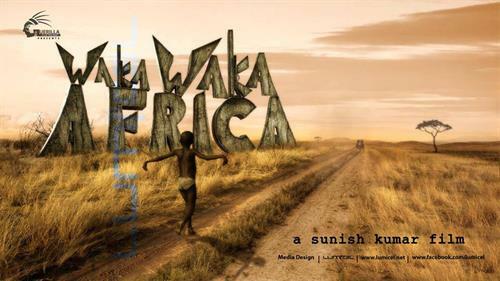 This project titled 'Waka Waka Africa' is helmed by Sunish Kumar who has proved his mettle staying behind the camera working with popular film makers Rajiv Menon and Suraj Varma. Sunish after an effective experience working under the shade of his masters shifted his base to Uganda, an East African country where he matured himself skillfully learning the art of film making. A few years of acquaintance with the place was much enough for the young film makers who carried a 'seed' which eventuated got natured inside his minds. Sunish Kumar, the man coupled with inborn talents is on the way for his maiden venture creamed with a unique plot, to be told on the back drops of West Africa. Sunish is currently working on the screen play of the movie while the pre production works has already begun. With a team of professionals having experience in the industry, Sunish is confident that his movie would be a 'special gift' to the malayalam movie lovers. The visuals would be shot by Sinu Sidharth, a young cinematographer who proved his skills behind the camera for movies like 'The Train','Nayika','Lissamayude Veedu' and 'Bhakti Prasthanam'. The movie will be produced Guerilla film factory. With the cast getting finalized, the movie will start rolling in March 2014.